Denver Moore spent the first thirty years of his tumultuous life caught in the sharecropping cycle, a system Southern farmers use to basically enslave poor field workers. He jumped a train to Fort Worth and made a slightly better life for himself as the stereotypical homeless man, wandering the streets without a penny to his name. At the same time, a man on the opposite end of society named Ron Hall was enjoying his profitable art dealing business and newly repaired relationship with his wife, Deborah. Their worlds collided when Deborah convinced Ron to volunteer at a mission for the homeless on Tuesdays, which turned into every day when they felt God calling them to reach out to the underprivileged. Denver and Ron met in the serving line at the mission and slowly became best friends, and when Deborah was diagnosed with liver cancer, Denver prayed for her ceaselessly. It was through Deborah that Ron and Denver became less like friends and more like brothers, growing together in their faith in God. When Deborah passed away, a new mission and chapel were built in her honor and Denver often told his story there, moving thousands to tears and inspiring them to strengthen their relationships with God and with their families. This book was especially emotional because it is a true story, so all the sadness and grief described is written from the heart, and the stories told by both men are so incredibly personal that it is impossible not to empathize with their hardships and losses. The story began with a heartrending childhood tragedy, climaxed with a heartbreaking death, and finished with the heartwarming achievement of a dream that could’ve died with its dreamer. The three main characters are Denver, Ron, and Deborah. Denver is a black man who escaped a life of modern-day slavery to become a homeless man on the streets of Fort Worth, Texas. Although he can’t read, write, or really do anything except farm work, he has brilliant, logical advice that changes Ron’s life. He has a strong faith in God despite his rough life and his loyalty to Ron is literally…indescribable. It honestly feels insulting to him to attempt to comprehend his loyalty and the goodness of his heart. When Deborah was sick he prayed for her all night without stopping because he reasoned that there should always be somebody praying for her recovery, even at night. Ron used to be concerned only with his work, for which he traveled around the world. He and Deborah grew apart over the years until eventually he cheated on her. After confessing to Deborah, they went to marriage counseling, bought a house in Fort Worth, and began serving food at the mission. Ron’s heart was changed when he saw the extreme poverty people were living in, and he started doing everything in his power to help them. Deborah is religious, charitable, and one of the most positive people who has ever lived. She retained unwavering faith in God even on her deathbed, and through her faith changed many, many lives. This book has so many important themes that it’s hard to pick the best, but I think one really stands out: don’t judge somebody until you have walked a mile in his shoes. Initially, Ron thought Denver was a formidable, unapproachable, dangerous street bum. When he got to know him better, he realized Denver was smart and friendly, and that he understood life better than Ron himself. At first, Denver thought Ron and Deborah were only helping at the mission because they pitied the poor and wanted to do their good deed to get on God’s good side. Little did he know how devoted they would become to the mission and to Denver. The story definitely addresses the issue of poverty. The whole book is about helping the poor and making the world a better place. It also explores the issue of questioning God. When Deborah, the most saint-like woman on earth, died, all of her friends and family were angry with God, wondering why he would take such a wonderful person who could have done so much good from them. In the end, Denver says he will pick up the torch she put down and continue her work, meaning that her death will touch more lives than she could have in her lifetime. One of my favorite quotes from the book is, “There’s somethin I learned when I was homeless: Our limitation is God’s opportunity.” This quote by Denver really made me think, because of the truth in it. When we feel alone, helpless, and completely lost, that is when God will show us he is there. In Denver’s words, “When you get all the way to the end of your rope and there ain’t nothing you can do, that’s when God takes over.” We may not notice God when things are going smoothly, but when we need him most, if we believe, he will be there. 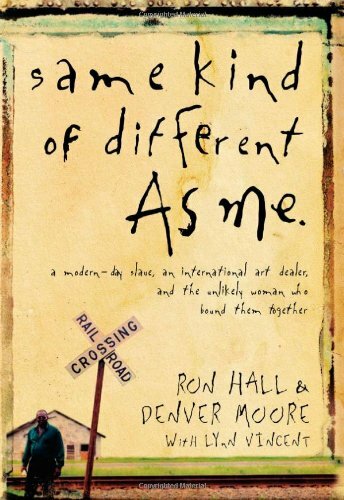 Another quote is, “I was embarrassed that I once thought myself superior to him, stooping to sprinkle my wealth and wisdom into his lowly life.” Ron’s embarrassment at looking down on Denver goes back to the theme of the novel: don’t judge somebody until you’ve walked a mile in his shoes. Ron’s first impression of Denver was drastically incorrect, which emphasizes the reality that people aren’t always who they appear to be. This inspiring true story changed my view of many things and made me realize that everybody has a story. I think it is an interesting book and amazing almost to the point of unbelievable. I would recommend it to anybody who wants to see different views of the world - from the eyes of a man who has been at the very bottom, one familiar with the top, and a woman who left it completely. Wonderful review, thank you. Some of your observations and quotes you pulled moved me to tears. Well written.